Aztec rulers were called tlatoanis (emperor or king equivalent), whenever they rose to prominency, were regarded as touched by the gods. They built spectacular pyramids that served as tombs. Sometimes they were mummified, sometimes just interred with their most valued belongings. Their closest servants and the bravest warriors, took their lives when the tlatoani died, so as to be buried with him in the pyramid, this was considered the highest honor. In death, aztecs were welcomed to the underworld by Mictlantecuhtli, a blood splattered skeleton and God of Death. Through Mictlantecuhtli, the power of the underworld poured into the material world, infusing the pyramid and the bodies buried in it with necromantic energy. Aztec mythology can easily be replaced with any other similar culture. As it is, this dungeon can be inserted in any campaign setting. It could even not be explained at all. 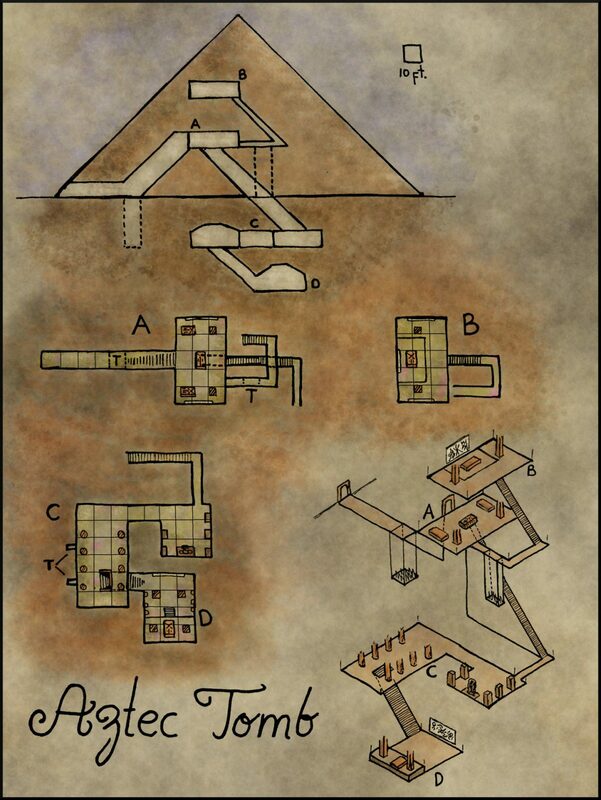 An abandoned pyramid from a long forgotten civilization won’t have much to tell, or will it? A.- The entrance to the pyramid was supposed to be hidden but it was opened by thieves long ago. Just before the stairway, there is a pitfall trap. It opens down to a 30ft drop. The bottom is spiked. A Perception check DC18 is needed to spot the pressure plate that springs the trap. If anyone is actively looking for traps, an Investigation check DC 15 reveals the trap. It can be jumped, avoiding the pressure plate altogether, or it can be disabled with a Thieves’ tools check DC 18. After being sprung, the trap resets itself automatically at dawn. If anyone presses the plate, everyone who is standing on the 10 ft. square must roll a DEX save DC 15. A target takes 3d6 bludgeoning damage on a failed save from the drop. Roll an attack +8, if it hits, the target also receives 4d6 piercing damage from the spikes. After the first stairway there is the servants’ chamber. Two bas-relief serve as decoration, they depict Mictlantecuhtli and the exploits of the Tlatoani. Three stone sarcophagi hold the remains of the most faithful servants. In the chamber, the remains of criminals who tried to deface the interior of the pyramid can be found, they were killed by the servants. The servants emerge from the sarcophagi if the chamber is explored. They do their best to protect the pyramid (Specters, Ghouls or Wraiths depending on the CR desired). The chamber has two hidden exits, one easier to find than the other, that leads to a fake King’s chamber intended to fool sackers. B.- The hidden door that exits Chamber A towards B. Can be found with an Investigation check DC 14. The hallway that leads up to B, also hides a pitfall trap, identical to the one found before, except for the dimensions of the shaft. Chamber B is a fake King’s chamber, it’s never been found before, but doesn’t offer much. There is a King’s Sarcophagus. If the sarcophagus is opened, 4 Ghasts (or the appropriate threat for the party) come out and attack the intruders. When the PC’s return the chamber A they can find the other secret door (Investigation check DC 17), hidden inside the center sarcophagus. It leads down below the pyramid itself to the real burial chambers. C.- The first chamber under the pyramid has an effigy of Mictlantecuhtli made of obsidian. It’s sculpted in such a way that, regardless of were anyone is, it appears to be looking directly at the observer. Surrounding the effigy are 5 upwards sarcophagi that hold the remains of the five bravest warriors of the tlatoani. They come out of their boxes to fight one more time for their king. You can use the stats of revenants, or ghasts with obsidian axes, according to the CR. They wear gold jewelry that can be looted after the fight. The adjoining chamber is a grand gallery. All the walls are adorned with hieroglyphs and murals about epic stories. There are two poison dart traps hidden in the chamber. A Perception check DC18 is needed to spot the pressure plate that springs the trap. If anyone is actively looking for traps, an Investigation check DC 15 reveals the trap. It can be jumped, avoiding the pressure plate altogether, or it can be disabled with a Thieves’ tools check DC 18. After being sprung, the trap resets itself automatically in 30 minutes. If anyone presses the plate. Roll an attack +6, if it hits, the target receives 2d4 piercing damage and has to roll a CON save DC 17. A target takes 5d6 fire damage on a failed save, or half as much damage on a successful one. D.- The Tlatoani is buried in this chamber, which is infused and protected by the power of Mictlantecuhtli, the area is considered desecrated. Along the walls, clay vases hold what’s left of the tlatoani’s organs, which were harvested before being buried here; only dust remains. The tlatoani emerges from his sarcophagus to confront the party. He should be a sizable foe, like a mummy lord, a dread wraith or a bumped up revenant. He won’t fight alone, shadows come from the walls and clay vases to aid him. It must be a tough fight. After being defeated, the party can search the sarcophagus. The tlatoani’s most valued possessions are here.